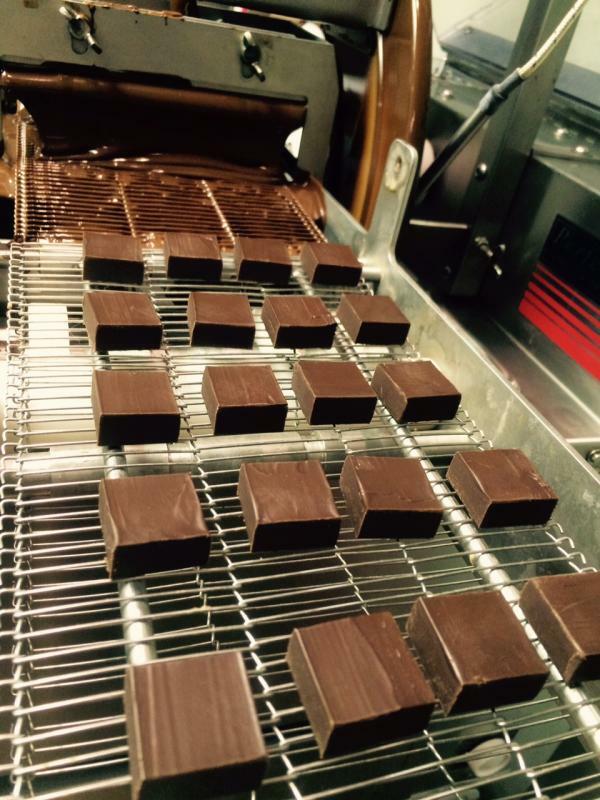 As a lot of you already know, Kerry Beal has been working on a device to help the artisan chocolate maker – the EZtemper. 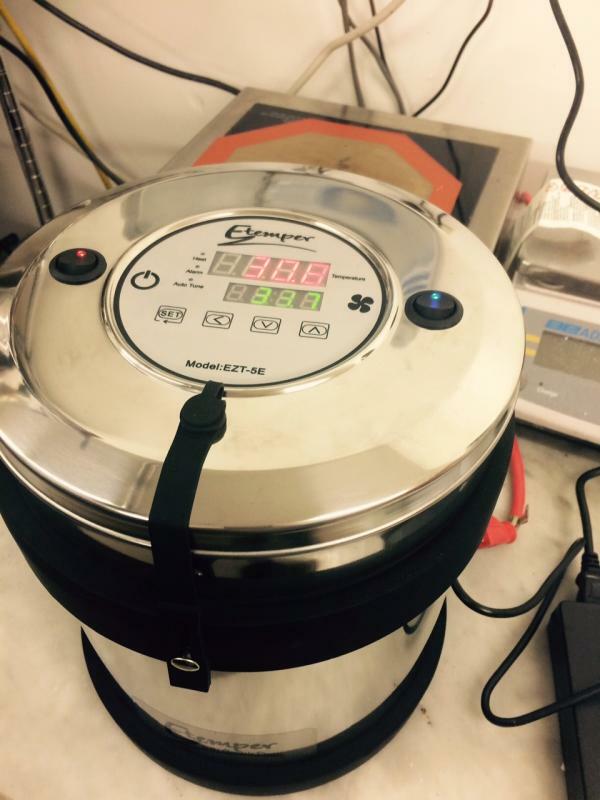 I got a chance to see the EZtemper in action this weekend at the eGullet Chocolate and Confection 2015 workshop and it was nothing short of amazing. Dead simple to operate, you basically just load a container with cocoa butter and turn it on. Allow it to work overnight (about 12 hours, I think) and the EZtemper will produce cocoa butter silk i.e. Form V Beta crystals. 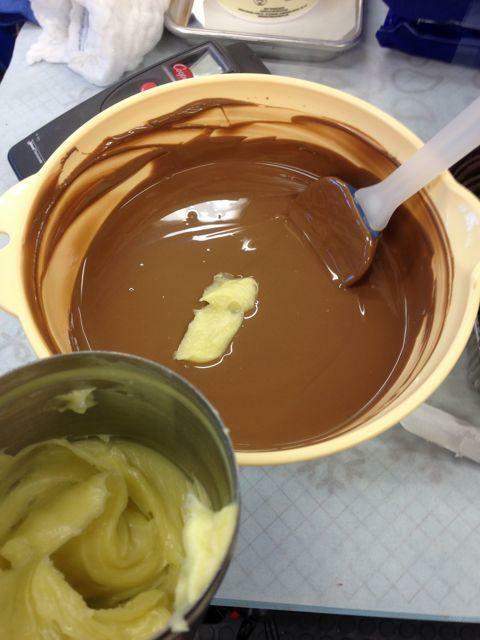 The cocoa butter is transformed into a mayonnaise-like consistency which can then be used to instantly temper any melted chocolate or ganache. 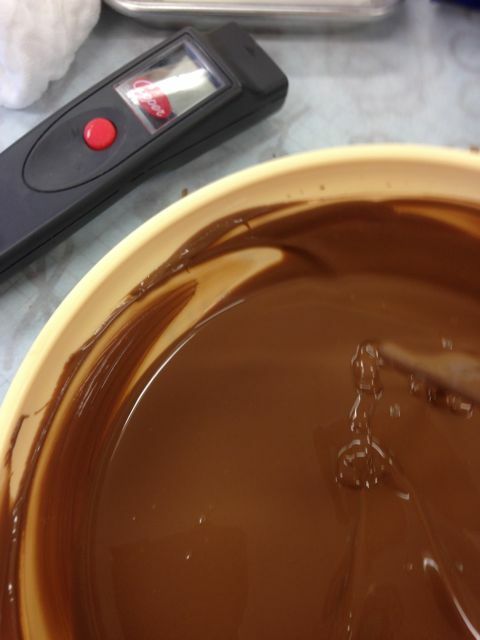 Like Mycryo, you add 1% by weight to melted chocolate at the proper temperature; however, the chocolate silk produced by the EZtemper is superior, in my opinion, because you don’t have to worry about melting out the Mycryo cocoa butter crystals and incorporating it into the melted chocolate. 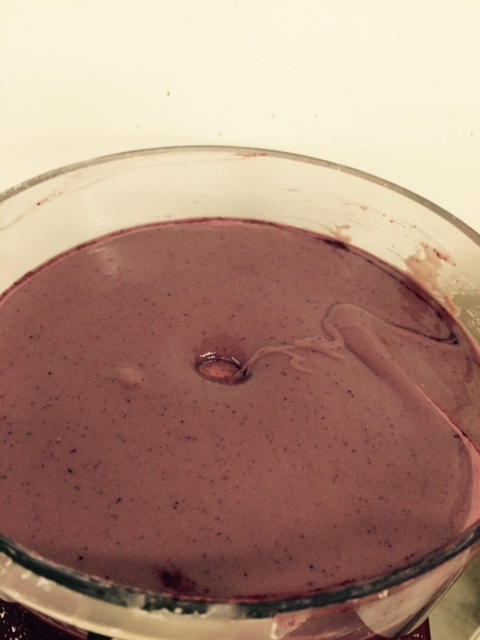 You just have to stir the silk in – much more easy. Not only that, but you can use it to temper your ganaches which we all know produces a product with longer shelf life and better mouthfeel. As if that weren’t enough, it also causes your ganache to set up much much faster. So you can pour out a slab of tempered ganache and move to cutting and enrobing a short while later. 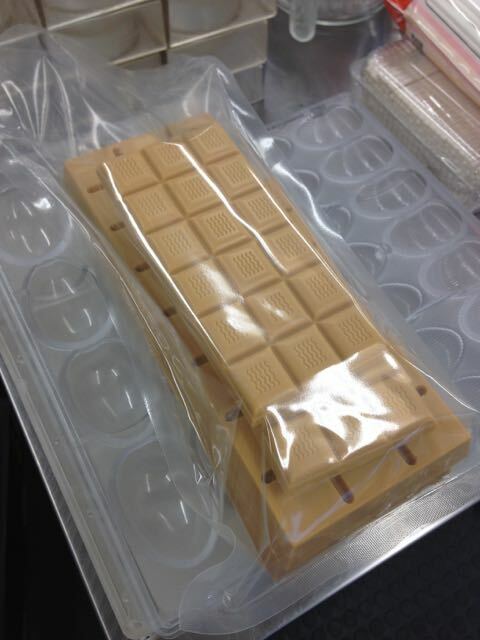 I think this device is going to revolutionize the chocolate industry. 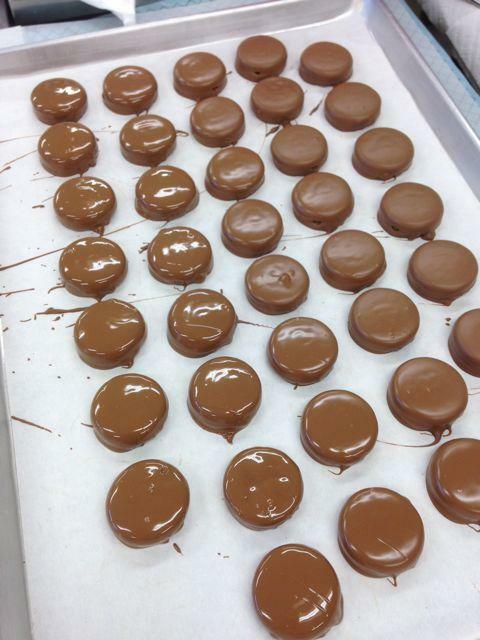 You should consider it for your confectionery business if you want to save a lot of time and produce a superior product. Controlled temperature and duration. Huh. Sounds like sous vide. I'm a big fan of general purpose tools such as my Anova One circulator ($200, -vs- $999 for the EZtemper). Or is there an undisclosed ultrasonic component in play here? If so, should we all be looking for other uses for an ultrasonic insert for our water baths? More quickly break down collagen in a long meat cook? I'm sorry. Maybe I don't understand sous vide. Doesn't that work by sealing an item in a plastic bag and submersing it in a controlled temperature water bath? If so, it would be an entirely useless method for tempering chocolate. Why would it be useless? Just seal the cocoa butter in the pouch, put it into the waterbath and leave it to do its thing, just like the EZTemp thing. Then when it's ready, just dry the pouch completely, remove the cocoa butter and you've got the same product. I can't justify $1000 on something I can do on a slab of marble in under 10 minutes I would have to increase my production a heck of lot to need it! Don't you just love new toys, especially when they work so well and save time? 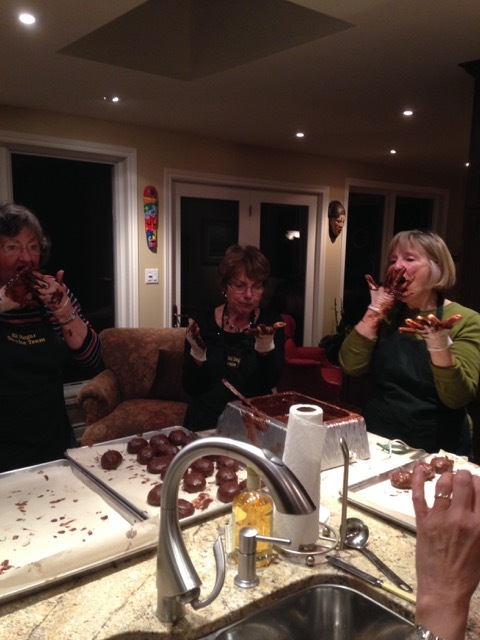 While at the Chocolate Workshop last weekend, Kerry Beal show us her EZ temper. I couldn't believe the things I was hearing, so I had to play with it myself. 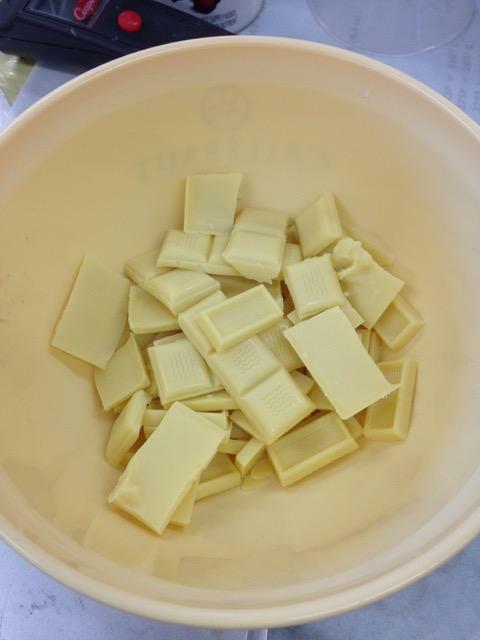 We made some white chocolate ganaches with and without the cocoa butter seed. It was dramatic to see the difference in time it took to be ready to cut and enrobe. 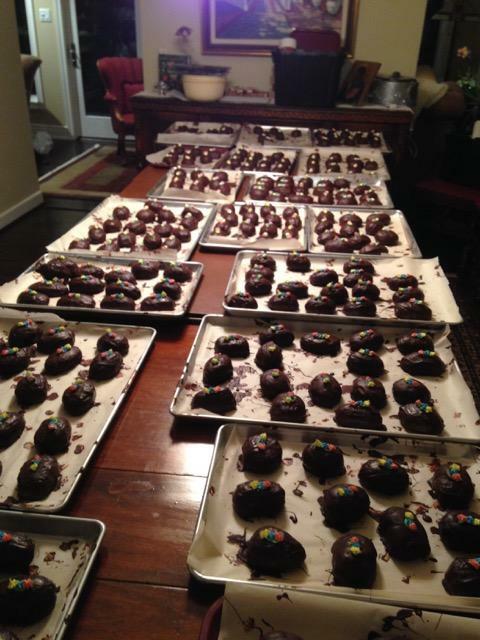 I have made thousands of ganaches, but still have problems with some of them setting up (or not setting up). Not any more!! I had to have my own machine and I played with it yesterday. 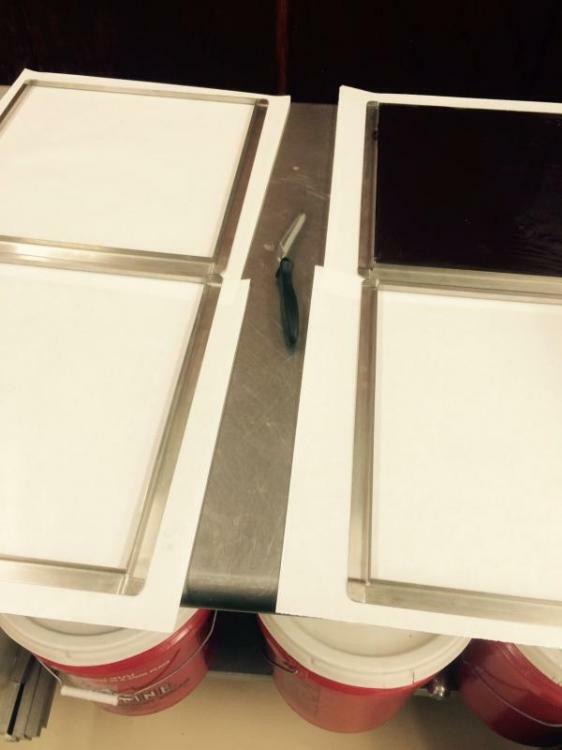 I had to make 4 frames of the same ganache for an order. I thought this would be a good test. I made the batches as usual, but added the "silk". Instead of having to wait overnight, they were all ready to cut in under 3 hours. This is amazing. I can speed up production considerably by using it. 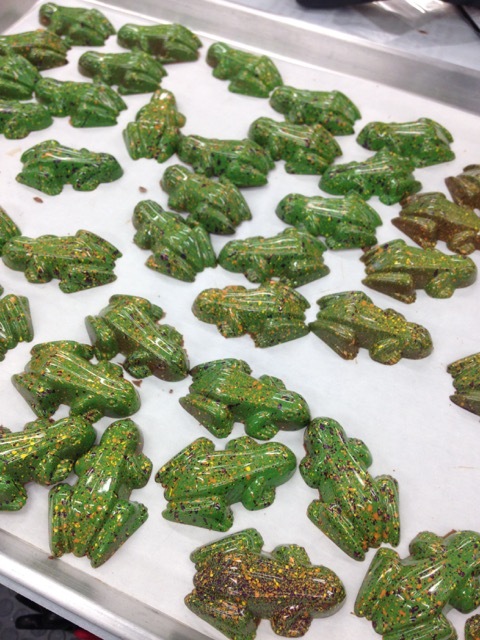 At the workshop, we made meltaways and giandujas, seeding with the silk. I can make slabs and cut and enrobe the same day. This is a huge saving of time for me. Cut beautifully and on the enrober, all within a few hours. This is the "silk". 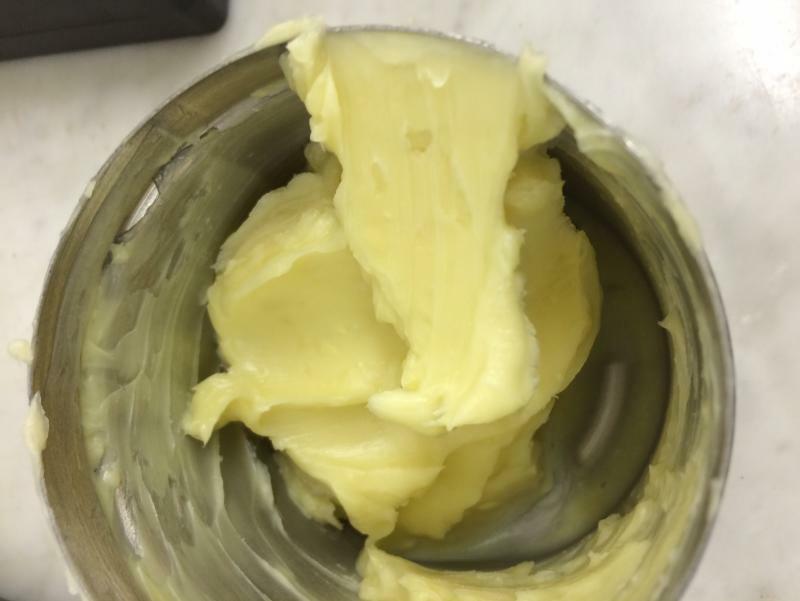 Cocoa butter that is melted and held at 34C give or take a degree. It has the consistency of mayonnaise. You only use a tiny amount, about 1% of total weight. 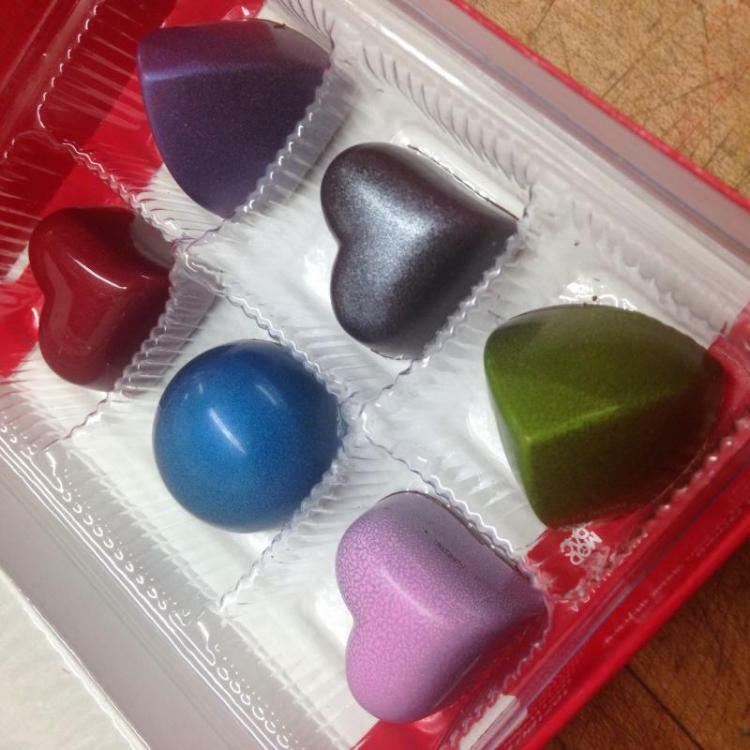 I think this is going to be a game changer for me and anyone who loves to play in chocolate. Thanks Kerry for designing such a great tool. I don't do anything with chocolate, but I want this! Does the machine hold the (almost-but-not-quite-melted) cocoa butter at the right temp forever--or at least as long it stays inside the machine? Any harm done by removing a little "silk" and then returning the container to the machine? 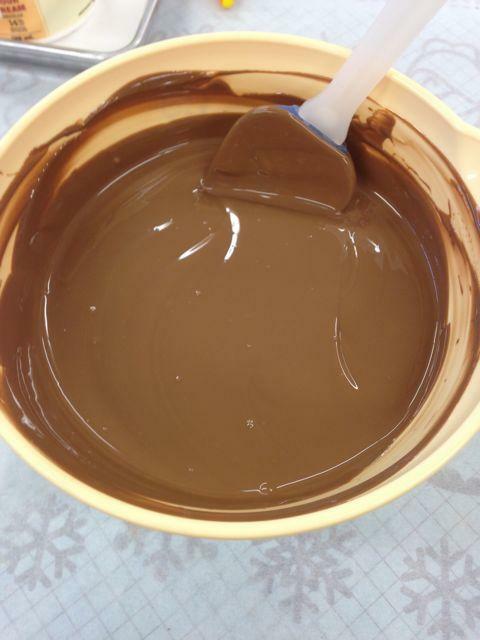 I'm thinking of situations where a user works on many different projects (lining molds with chocolate, making ganaches, closing molds, dipping chocolates) and might wish to keep the cocoa butter ready over a period of many days. As was pointed out in another thread, this is very much like Mycryo, but by the time one brings the chocolate down to the right temp, the Mycryo is rather difficult to dissolve--I often have to use an immersion blender to get those last grains of cocoa butter to melt. And speaking of Mycryo, why didn't Callebaut think of this? Jim - I can probably answer that one - it does indeed hold pretty much forever. Having had some cocoa butter in the prototypes for several months the process seems to go forward and I think form VI crystals form because I have noticed some change from the silk like consistency to a firmer but still very usable consistency. One simply takes out the amount needed and puts the container back in the generator. You would leave the generator on all the time and add new containers of cocoa butter when needed. 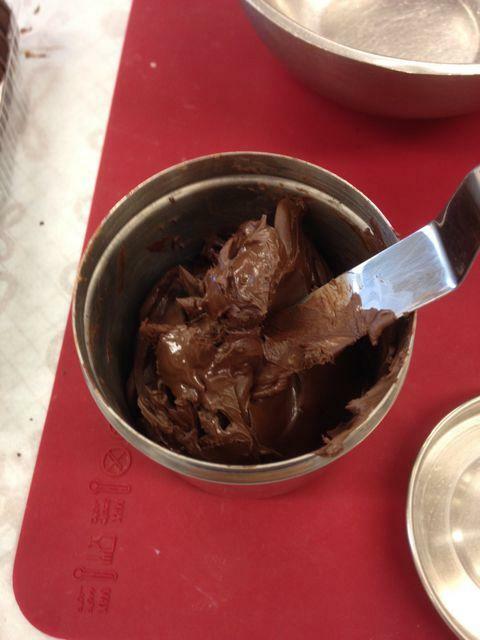 You can also work with chocolate at higher temperatures so the seed mixes in readily. 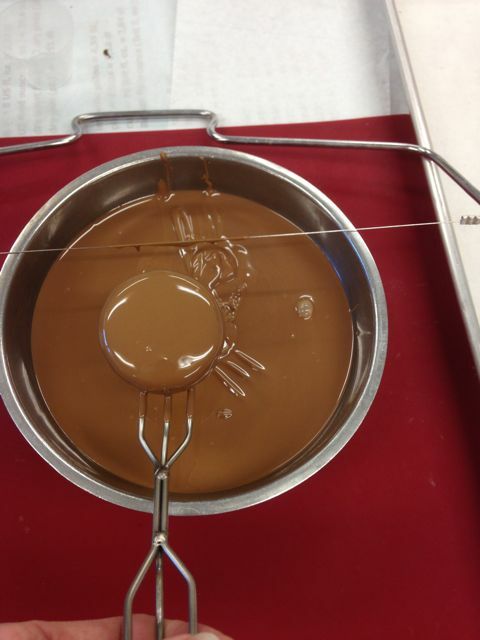 It also mixes in easily to lower temperature ganaches, giandujas and meltaways. This technology is used currently in industry - the idea was to make a much less expensive version than the industrial for smaller shops. Suspect Callebaut would want to produce something a little more 'shelf stable' though. I have used Mycryo and while it is a tool, it is nothing like the Eztemper. As you say, it is difficult to mix in. I found the EZ really great to use because as I was making each ganache, I put the container back in the unit, and would remove as I needed it. On the last frame, I didn't measure the cb, just guessed. In a ganache, I don't think the % is as critical as in plain chocolate. I have just left the unit on and will as long as I think I'll be working with chocolate--which seems to be all the time:) It comes with two SS containers to hold the cb. When I finished up today, I combined the two containers and filled the empty one with more cb so it will be ready whenever I need it. They are used for immediate pre-crystallization for one shot depositors and various other functions. One of my early experiments - on the left an offset dipped just before adding seed - the one on the right dipped less than an minute later. Just tried out the EZTemper for the first time. I needed a small amount of white chocolate (approx 200 gems) to temper to use as a decoration for some enrobed pieces. After melting the white chocolate - which is an all organic chocolate - I added about 1 gram of cocoa butter from the EZTemper and in seconds the white chocolate was tempered perfectly....it was the easiest tempering I've ever experienced. Could this be fudged with a lab-grade immersion circulator? Had more fun today with the EZtemper. 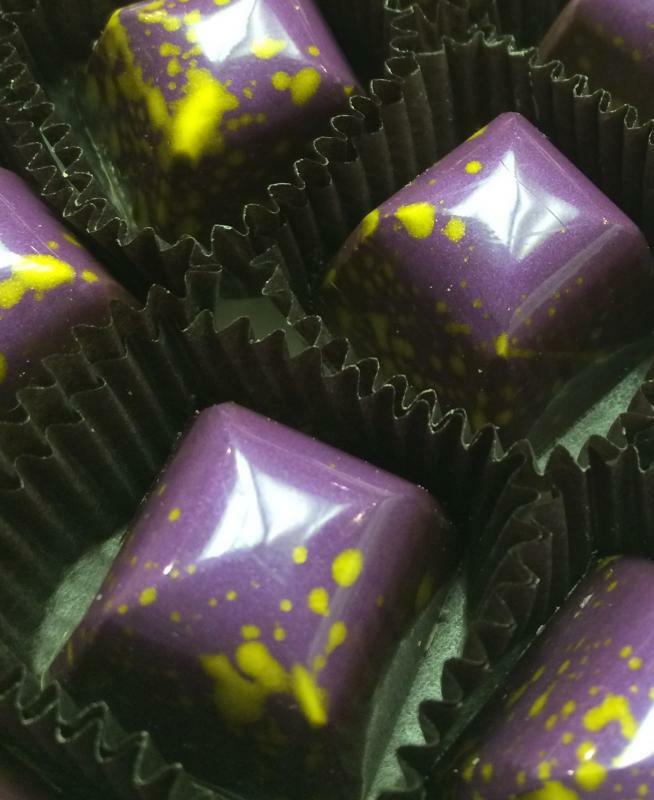 I had to get out an order for 400 Blackberry Cheesecake bon bons. I needed to fill and close today for an event tomorrow. 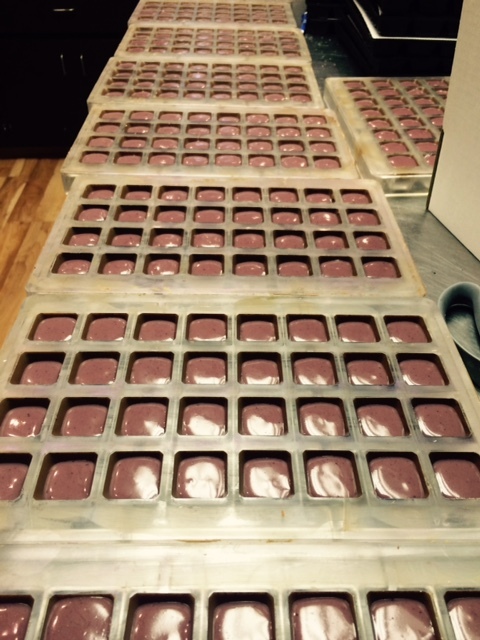 I made 2100 gms of ganache. Closed and popped out in under 2 hours. This was very fluid because I didn't need a long shelf life. Normally I would need to leave overnight to be able to close. Within an hour, it was set enough to close. It wasn't totally setup, but enough. Part of the appeal is that the cb is always ready. You don't need to mess with a bag in water, or worry about having enough ready to go. 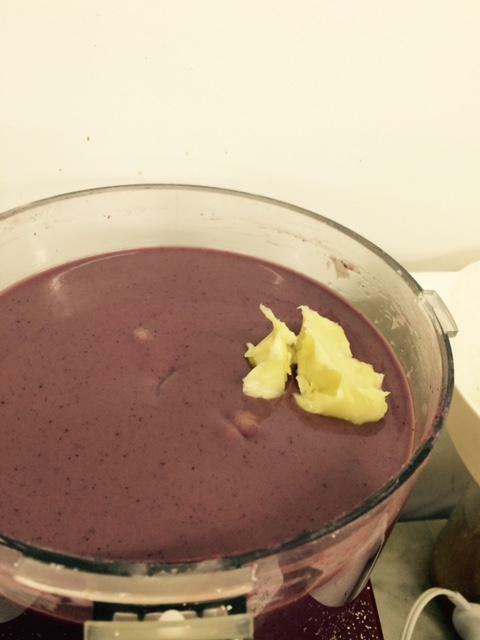 It is very simple to scoop out what you need and put back until the next batch. it takes very little electricity, so I will leave it on all the time. The cb is so close the the temp you need, that by leaving it out at room temp for even a minute will cause it to firm up. Looking back at the past year since I made the first prototype - I realize just how much my habits have changed. Like Chocolot I've gotten in the habit of backing off molds shortly after I pipe in the filling, cutting ganache slabs within a few hours of making them, tempering 100 grams of chocolate in seconds to paint the eyes on bunnies - the only time I've 'properly' tempered chocolate is when I'm teaching. I snuck the prototype into the luxury chocolate show so we could temper the chocolate in the mol d'art melters (hid it in a cupboard so no one would see it). When I helped the St Luke's church folks with their easter egg production this year I took the prototype over to temper in the mol d'arts - saved a huge amount of time over last year's production. 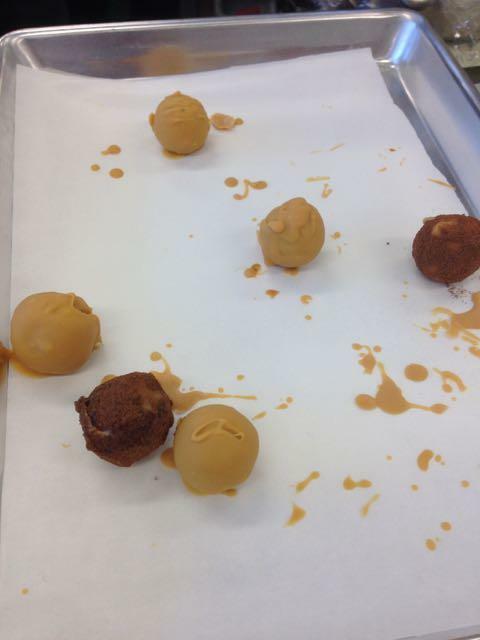 These were the frozen tea spheres dipped in caramelized white chocolate - also pre-crystallized with the seed. Remaining melted cocoa butter the spheres where dipped in - tempered in seconds and able to be removed from molds in less than half an hour. 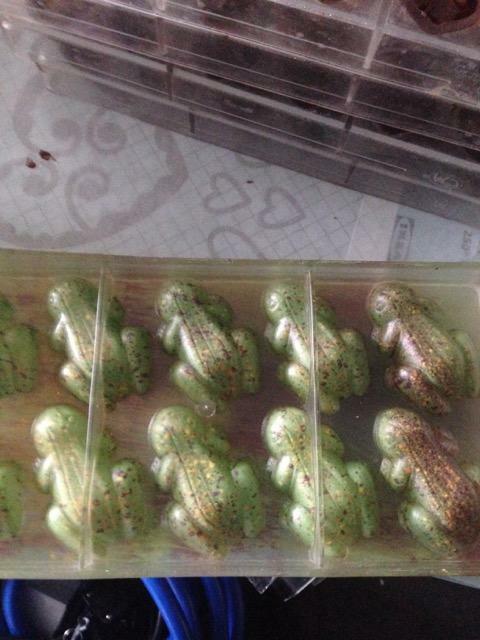 The coloured cocoa butter - put in at a second EZtemper at a higher temperature works perfectly for spraying. This might be a stupid question, but I've never had to think about it before - how do you get your couverture to working temperature without crystals forming so you can add the silk? Just cool it without seeding - you can add the seed at 33.5 degrees (or even a bit higher for dark chocolate) so you are actually above the typical working temp for milk and white. Interesting thing I've noticed - when you add the seed - the temperature drops about 1º C - I assume latent heat being released. Had a few minutes before I had to leave for work this morning so after I got the rug rat on the bus I decided to get some cookies dipped for an upcoming charity event. So in under 40 minutes I was out the door with 3 bags of Wegman's oreo type cookies dipped. Experiment underway to see if seed can be generated from chocolate - of interest to the bean to bar people who don't want to add anything more to their chocolate. Of course I'm starting with tempered chocolate which won't be where they are starting. Kerry, is your dipping fork custom made? Also, adding the cocoa butter seed would thin the chocolate wouldn't it, especially if you used the same chocolate and repeatedly seeded, correct? 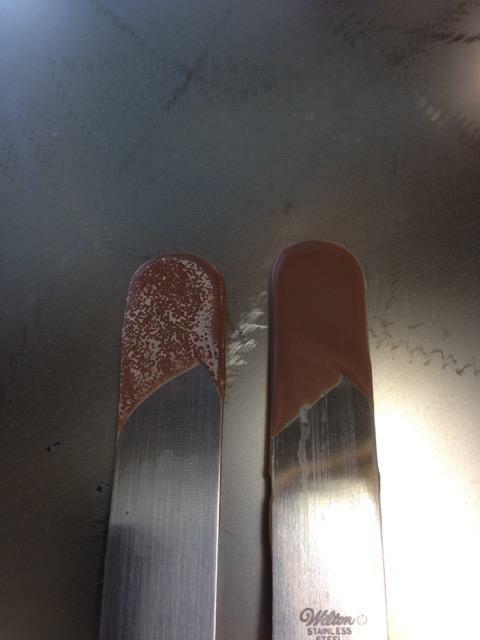 Is there anything you do to prevent this, or would you go ahead and use the chocolate thats been seeded for ganache, then start fresh with new chocolate? I hope that all makes sense, my only thought with this is having the chocolate get to thin over time, but I think most here do more chocolate work then I do. Otherwise, very innovative! Congrats on getting your product to market! Yes it is! I had the hubby of a coworker making me the fork part - I was going to figure out the wooden handle part - he came up with these - perfectly ergonomic, fully stainless so dishwasher washable - I really love them. Brought some to the workshop - PM me if you are interested in one. 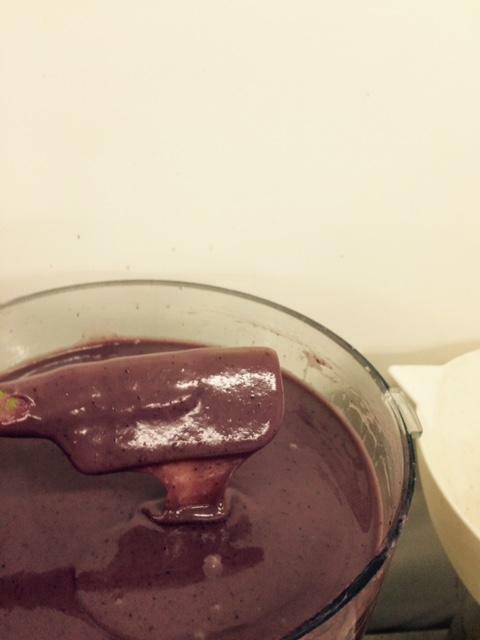 Adding the seed actually thickens the chocolate as it pre-crystallizes. However when I kept remelting and seeding the same bunny eye chocolate at Easter the dark chocolate did end up pretty thin - I suspect I'd added about 25% by the time I was done! I think starting with fresh chocolate or adding a percentage of fresh chocolate is probably sensible. I tend to only temper close to the amount I need for any given project - and I've always tended to make bark with the leftovers. It was an interesting experience getting this to market (and something I'm not anxious to repeat any time soon)! I have been reading all the various messages. I have to admit that this little machine has evolved my chocolate work. The time that the eztemper allows you to save is very big. 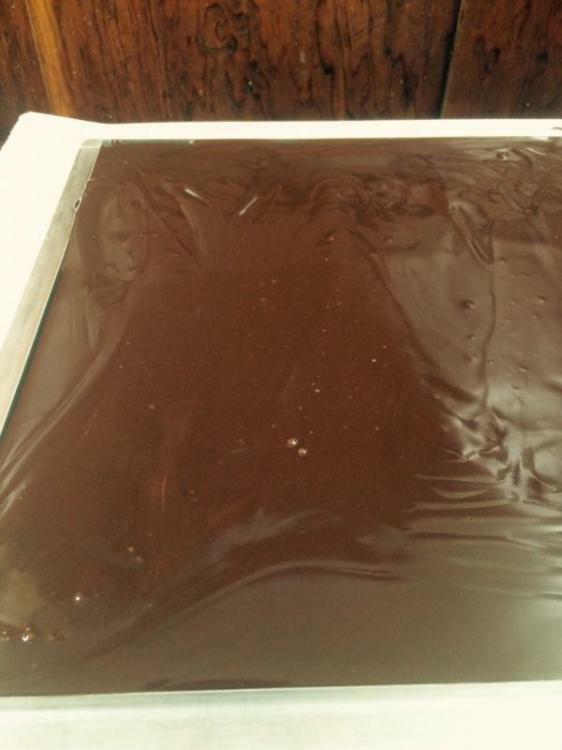 Using the silk allows you to warm your chocolate to 35c degrees and add the necessary amount and you have perfectly crystallized couverture usable at higher temperatures as well.. No microwave stress, 10 kg or 100 g same process. In regards to ganache, it allows to save 20h in production. "Dummy" proof - it brings crystallization to its simplest form and effort. If you respect the percentage use of .8 to 1 for chocolate products at 35c you can't go wrong. It brings simplicity - consistency and ease of work for a quarter of the price of the others on the market. We have tried the vacuum technic but it is a hassle to manage. My staff and I have adopted the use of the eztemper.